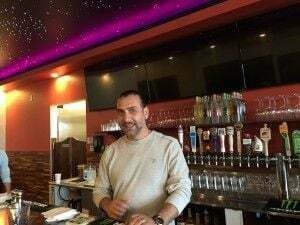 Sam Moussa is the general manager of Hapy Bistro in Pismo Beach. The wine shop at Hapy Bistro. Happy Bistro offers 24 draft beers and six wines on tap. The new Hapy Bistro that opened recently in Pismo Beach has received a warm welcome from locals. It’s in my neighborhood and close enough to walk to, which makes it very convenient for meeting friends for drinks and small bites. Now let me tell you the many reasons you should be interested in it, should you find your way over here looking for a different experience. The owners and management team have made their bistro a little bit of everything for people who enjoy lifestyle luxuries. 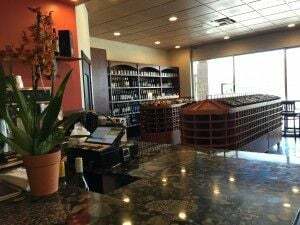 First of all, it’s a great wine shop filled with amazingly good value-priced wines. Hapy opened with 24 different draft brews and six wines on tap. When I met the owners and general manager before they opened, I encouraged them to add a dry rosé to their wine tap selections. They did, and I was quite pleased with the selection of the Martin Ray Rosé of pinot noir they brought in. That said, I’ve begun encouraging them to bring in a local rosé; we have so many excellent versions produced in both San Luis Obispo and Santa Barbara counties. Amazingly, the discounts don’t end with the wines and beers available by the glass. There are many excellent bottles of wines from California’s premium wine growing regions, including Santa Barbara, San Luis Obispo, Monterey, Sonoma and Napa Valley, again at low prices. That includes their very nice, but smaller selection of international wines. Each time I’ve visited since it opened, I have to chuckle over people openly gasping aloud when they see the low markups on wines they buy regularly. They offer over 300 different six-packs and 22-ounce bottles of beer. Hapy Bistro added a walk-in humidor with an incredible cigar collection where you can get custom, hand-rolled cigars. I estimated there must be 200 different brands in there. If you want to smoke one at Hapy, you can do it on the back patio and you get full service out there, too. Talk about a fantastic new addition to Pismo Beach. When warmer weather rolls around, that patio is sure to stay full. Not yet, however, since we’re in our June fog season and it’s chilly outside (that can be a good thing if it’s hot in your hometown). I first met two of the three owners/brothers Nabil and Sam Fadel (I didn't meet Tony Fadel), and their general manager Sam Moussa before they opened. Once I heard news about the place they were creating, I went over the next day and knocked on the front door. I was eager to learn what was coming into our small community. Moussa was surprised when I showed up, but once I explained why I was so nosy. he invited me in to see the place and meet the owners. It was still under construction but everything about the nice furnishings in the place told me they were totally committed to creating a great, new gathering place that would be around many years. I mentioned it to Nabil and he said I was correct. It's definitely an indication of good things to come. It is during times like this that I appreciate the fact I have 12 years dining room and kitchen experience in restaurants. It provides me real insight to the possibilities when someone is sharing news of the business they’re creating. Now lest you think Hapy is strictly a bar, that assumption is wrong. It's a family-friendly place where you can feel safe in bringing your kids for a meal, and your furry family members who can come dine with you out back on the comfortable patio. Hapy is open daily from 10:30 a.m. until 10 p.m. serving lunch and dinner. The food is excellent and quite reasonably priced. Plans are in the works to open at 7 a.m. for breakfast, and a Sunday brunch. During my last visit, Moussa explained that the project to create this special bistro began 2 1/2 years before they opened. A restaurant manager with 30 years experience, he told me the bistro is the combination of his and the Fadel’s histories. During later visits, Moussa would graciously thank me for being, "Our first customer before we opened.” I must say, with the comfortable, casual atmosphere, great choices in wine and beer on tap or by the bottle, great food so reasonably priced, and plenty of convenient parking — I knew immediately this place would fast become a destination for wine and food lovers. Contact wine writer Kathy Marcks Hardesty at kathy@centralcoastcritic.com.